Prismacolor Premier markers are low in odor, alcohol based , permanent ink markers. PrismacolorPremiere markers have 2 tips, one broad and one fine and a single ink reservoir for perfect color match, end to end The broad tip features 3 different drawing angles for a total of 4 different drawing widths. 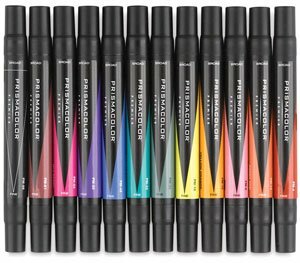 Prismacolor 4 in 1 markers are low in odor, alcohol based , permanent ink and have 2 tips, one broad and one fine and a single ink reservoir for perfect color match, end to end. The Prismacolor Premier Brush Marker has a brush tip on one end and a fine tip on the other, making it the perfect marker for fashion, design and hobby applications. The ink is the same that we use in our Chisel Tip Fine Art Markers and with one ink source ensures color consistency from end-to-end. Prismacolor marker sets come in assortments of 12 gray tones, warm, cool, and french(blue-ish). PRISMACOLOR MARKER SETS also come in assorted colors of 24, 48,72,120, 144 and 156. . Permanent, premium pigmented ink is non-toxic, archival quality, acid free and lightfast. It is also water resistant, has no bleed through and is smear resistant when dry.